With Our Whacky Whatch App you THINK the time!!!!!! Everyone who works with computers is familiar with binary numbers. Whereas the decimal numbers we use everyday employ 10 distinct digits (0-9), binary numbers employ only 0 and 1. And while in decimal numbering each column counts for 10 times the column to the right, in binary numbers, each column counts for twice the preceding column. So instead of a 1’s place, 10’s place, etc., in binary numbers there is a 1’s place, 2’s place, 4’s place, 8’s place, 16’s place, 32’s place… displayed as follows: 32-16-8-4-2-1. 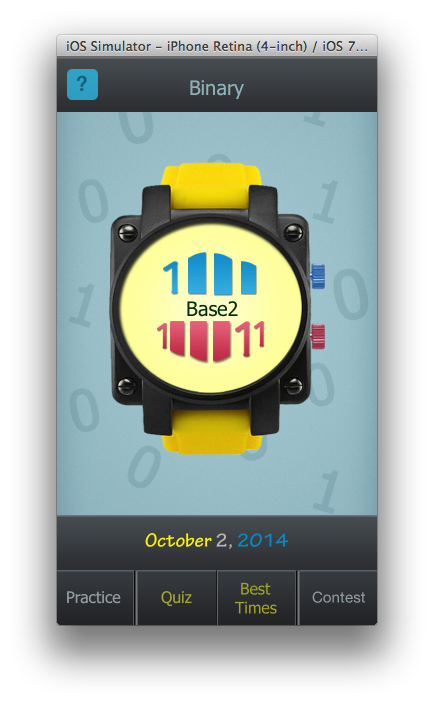 This watch uses binary numbers. The top row of 1 0 0 0 is, in decimal terms, equivalent to: 8 + 0 + 0 + 0 = 8. It indicates hours. The bottom row of 1 0 0 0 1 1 is, in decimal terms, 32 + 0 + 0 + 0 + 2 + 1 = 35. It indicates minutes. See this article on numbering systems which describes not only binary but other systems that are very useful in working with computers.